September | 2015 | Every good thing…. Back to the boat. Underway!! Temperatures are starting to cool off here and this has allowed us to start visiting the boat again without giving baby girl heat stroke. Yay. 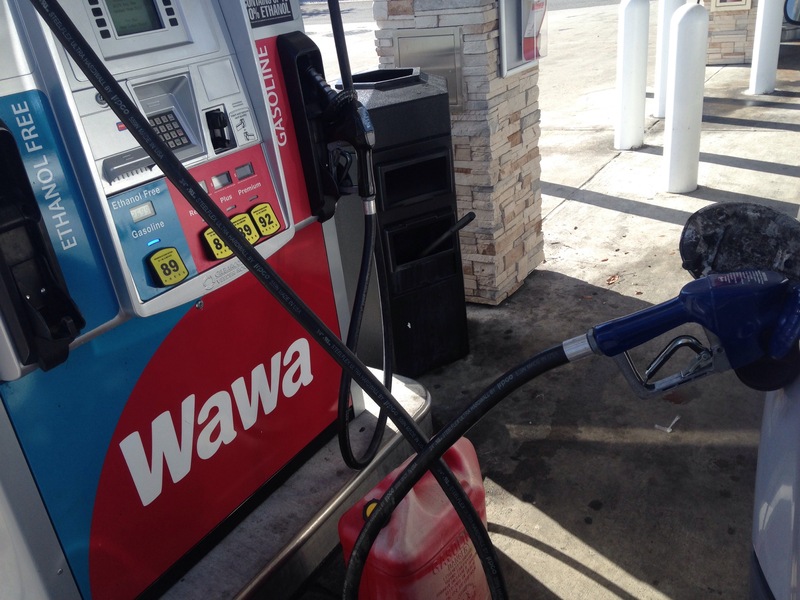 Saturday bright and early I went over to WaWa and filled up a jerry can on Ethanol free gas for the boat. Just say to corn in your tank. After getting some ice for the coolers we were off to the boat. 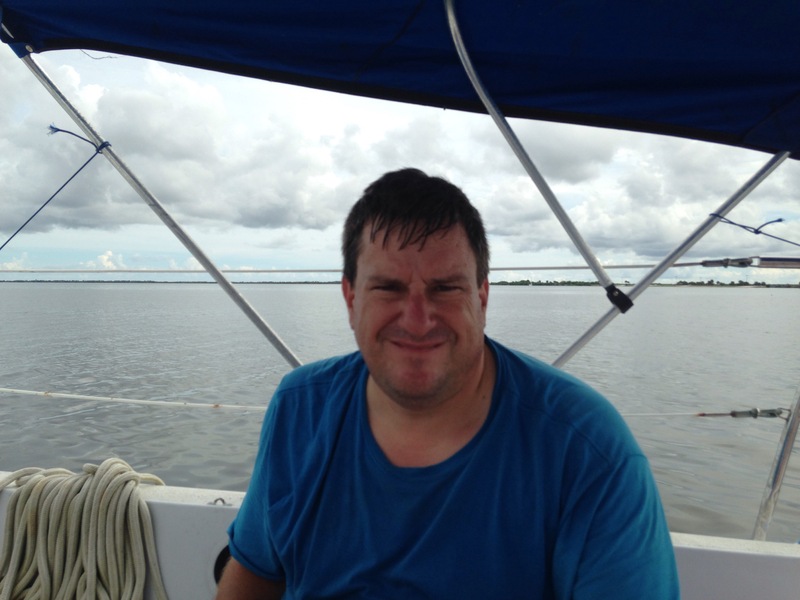 Once at the boat I removed the extra dock lines and then broke out the Loos gauge and adjusted the standing rigging. 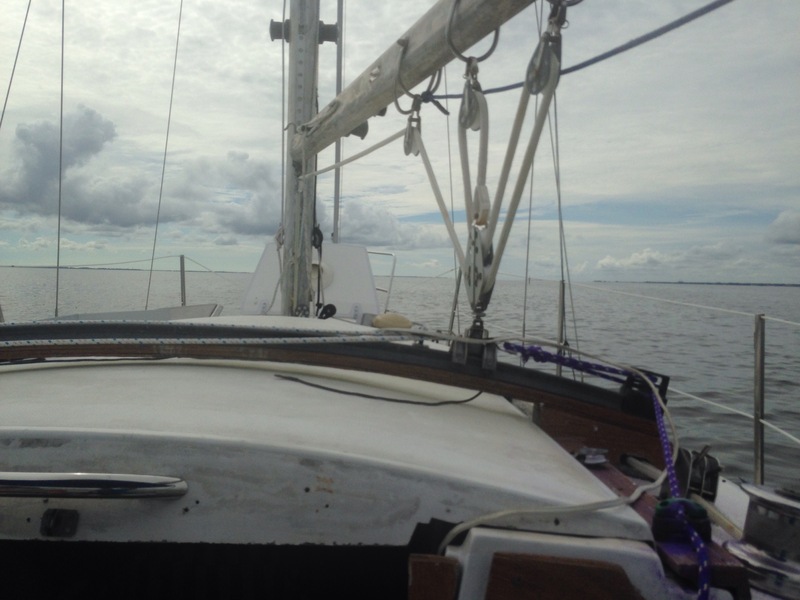 We needed to get the proper tension on the rig so I would not be stressed out lifting the front of the motor using the boom and halyard to replace the motor mounts. Adjusted my turnbuckles. All these are new as we replaced everything in overhaul but for the main chain plates. After adjusting rigging tension I reinstalled the solar panel I had removed for fear of a hurricane. 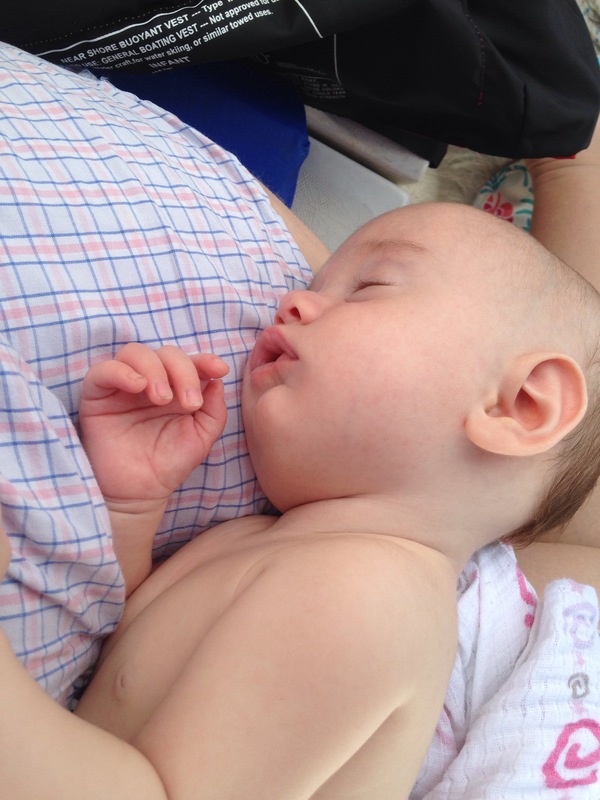 As this was going on Lori and baby were getting comfortable in the cabin. 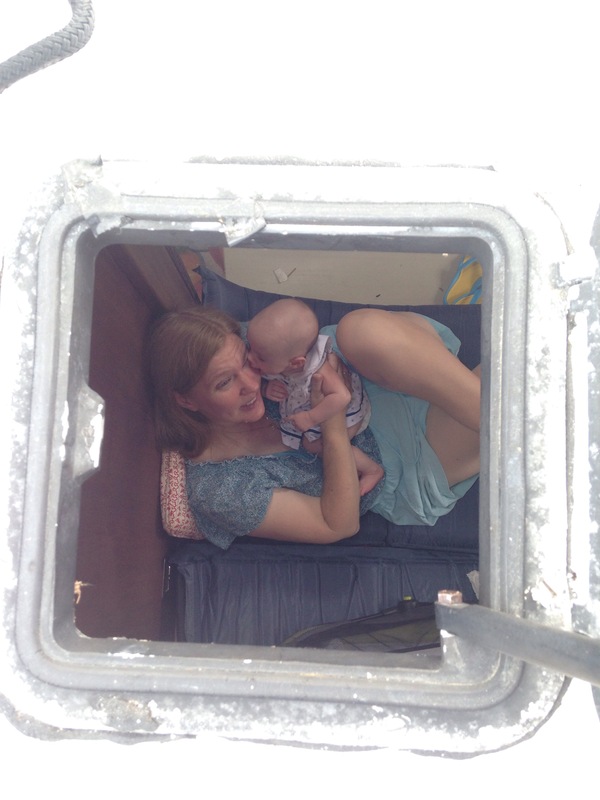 Lori and baby as seen thru the topside hatch. 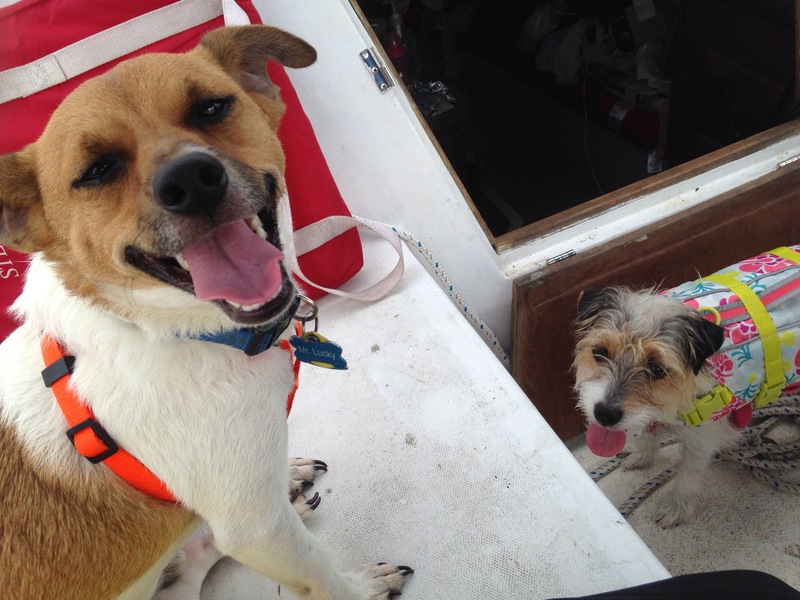 This was Elizabeth’s second trip to the boat. 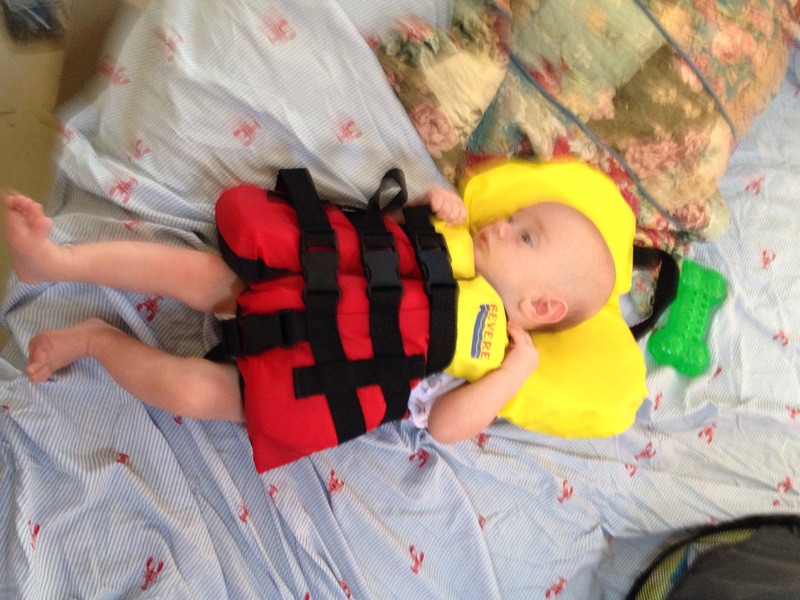 It is remarkable how much better her life jacket fit. 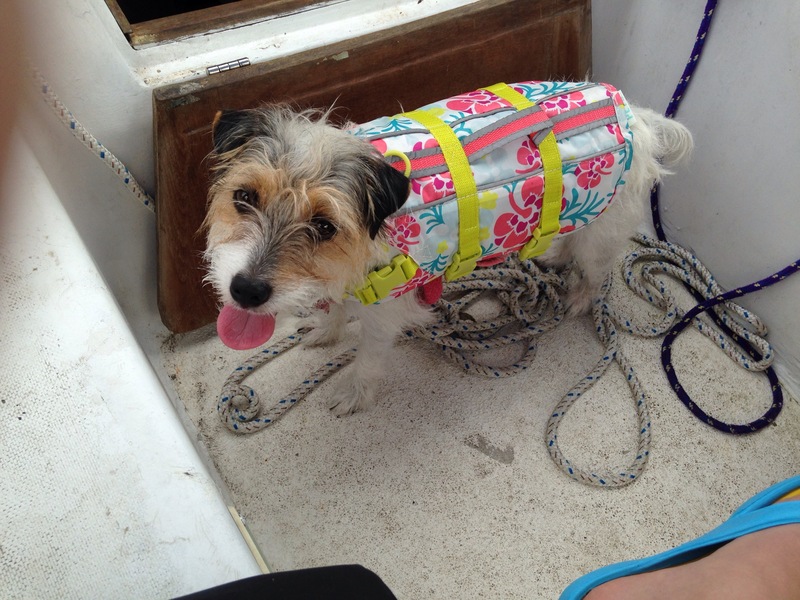 We would make her wear it whenever going on and off the boat. Here be baby girl in her jacket. 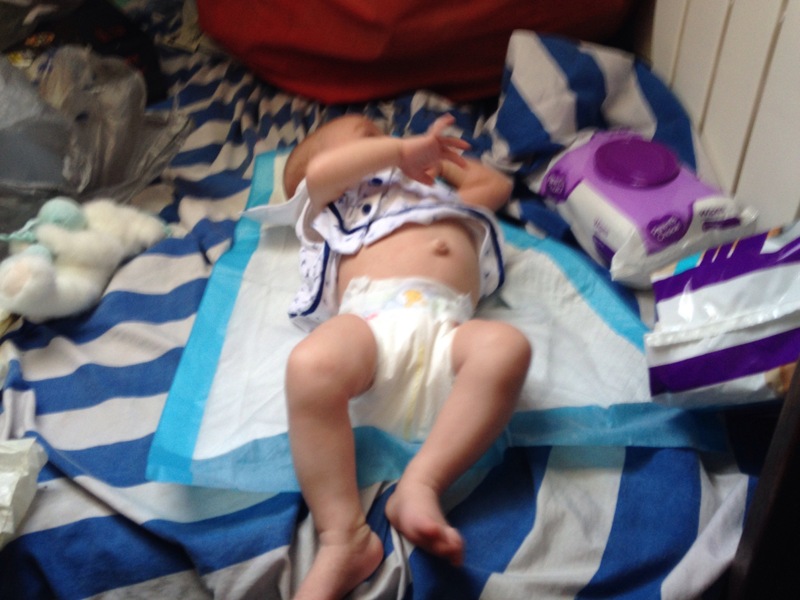 We discovered the V berth makes a good changing station. For dinner Saturday we went out to Chef Larry’s, good stuff. I spent Sunday morning replacing motor mounts. Lori took baby antique shopping. Motor Mounts and Damage Repair. To enable lifting the front of the motor I wrapped a loop of rope around the flywheel housing. Then hooked it to a cheapo block and tackle. This I hooked to the halyard running thru a loop on the boom. It worked perfect, I pulled and lifted the front of the 400 lb motor with one hand. After replacing the mounts (two hours due to some drilling) I readjusted the motor and shaft alignment (about an hour). 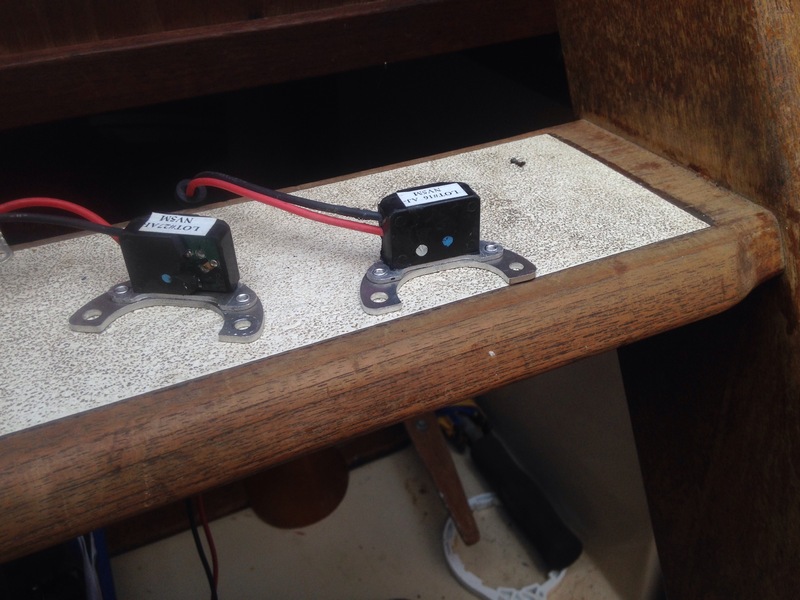 Also at this time I installed a 200 amp fuse link between the start battery and the starter as I had to disconnect the battery to safely work on the starboard motor mount. I then proceeded to repair a few lightning damaged items. 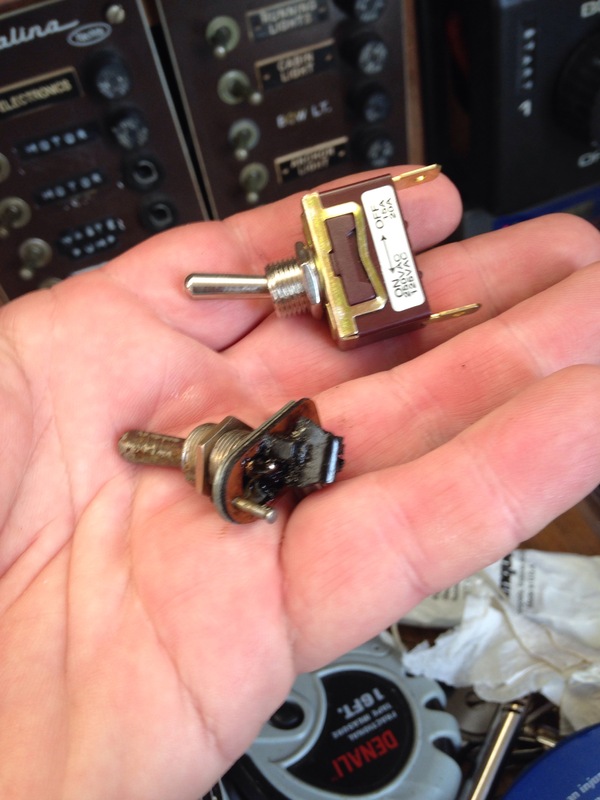 First was the Master switch that the bolt ate. New and old, what is left of it anyway. 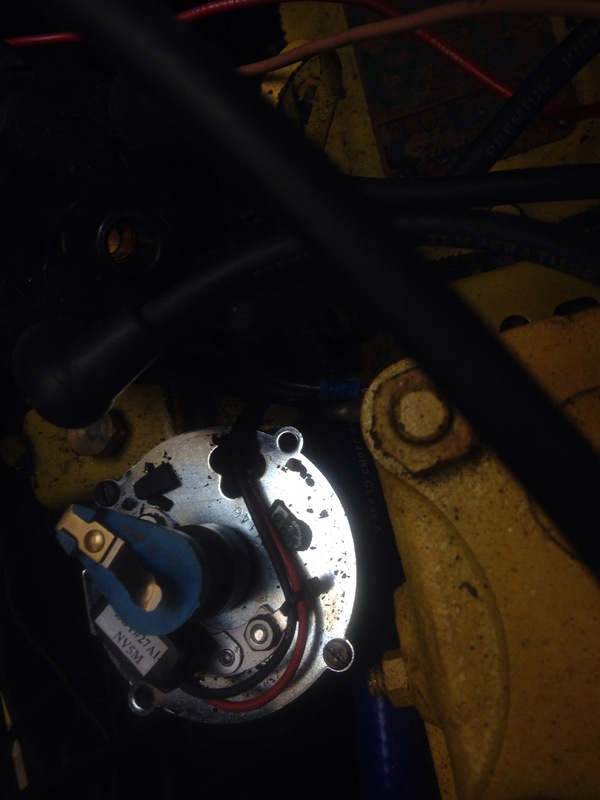 I then turned toward the motor and getting it to start. A few weeks back I had pretty much determined the issue was no spark. I ordered a new electronic ignition but had the worrisome feeling in the back of my mind it could be just the coil, we have two spare coils thanks to my old motorcycle fetish. On opening up the distributor cap I was greeted with a bunch of plastic bits. Distributor with plastic debris inside. It appears the bolt had blown up the sensor. Once the new sensor was installed I attempted to start the motor. She cranked up first try. I let it idle for about 30 minutes and our Carbon Monoxide alarm did not go off, successful exhaust system rebuild. At this point Lori and Elizabeth returned with dinner and I called it a day. This morning we started early. After a large breakfast I replaced the fried bilge blower and RPM gauge. Lori and I then worked on getting the boat ready to move. 2 years in the yard leads to some pretty sloppy housekeeping on a boat. We stowed the coolers below, removed a bunch of trash, organized our dock lines in a bucket, got out the boat hooks, found the floating cockpit cushions. Reinstalled the life sling. Tried to clean up and secure gear adrift in the galley. 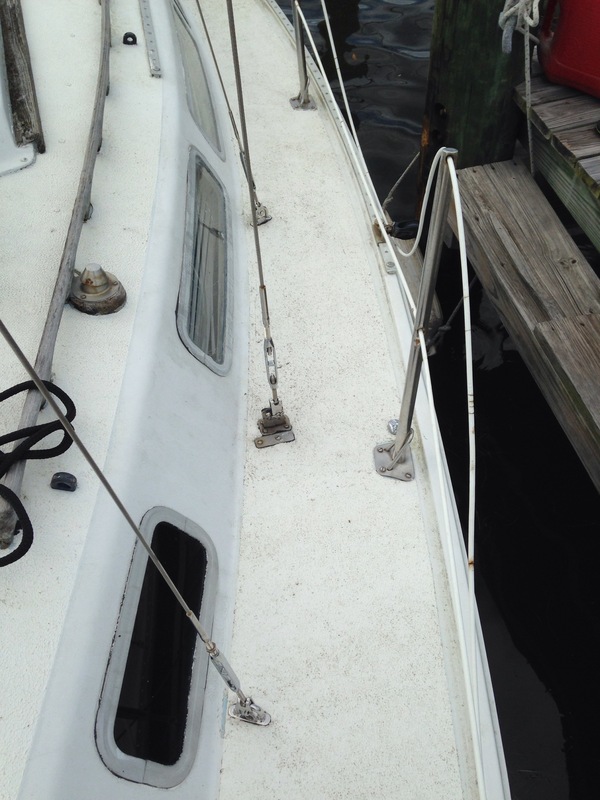 We got a start on the cleanup but there is still a lot to do as we need to bring aboard the dinghy and motor and secure everything so we can sail rail in the water if need be. Coffee grounds always seem to be the first to spill. After walking the pups and letting the motor idle for 30 minutes we cast off the lines. 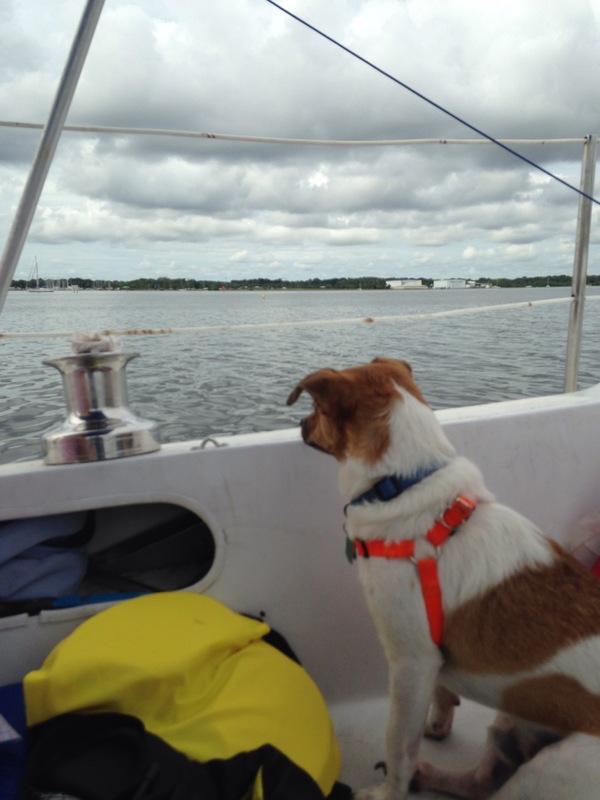 Our first trip outside of the marina on Lori Bell. The pups seemed to enjoy it. I need a vest because I run around so much. And probably the happiest critter aboard. 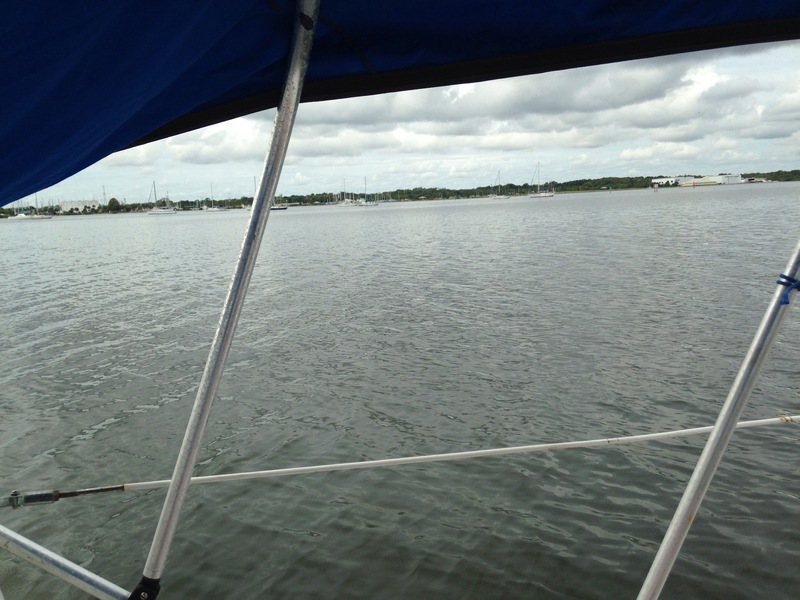 We motored up and down the Intercoastal Waterway for about an hour and a half. We then headed in, making a stop to clean out the waste tank on the way. 3.3kts at 980rpm and 5.5kts at 1600rpm. She started out a little rough making turns but as we headed in smoothed out to a nice buzz. Lori thought it was smooth the entire time but she was comparing it to our first trip in the marina with bad mounts and a fouled propeller. We will push the motor a little more next time. I do need to adjust the reverse band on the Atomic 4 as once the oil was warm reverse pretty much stopped working. Of course we hope to also raise the sails next trip. Sweet.